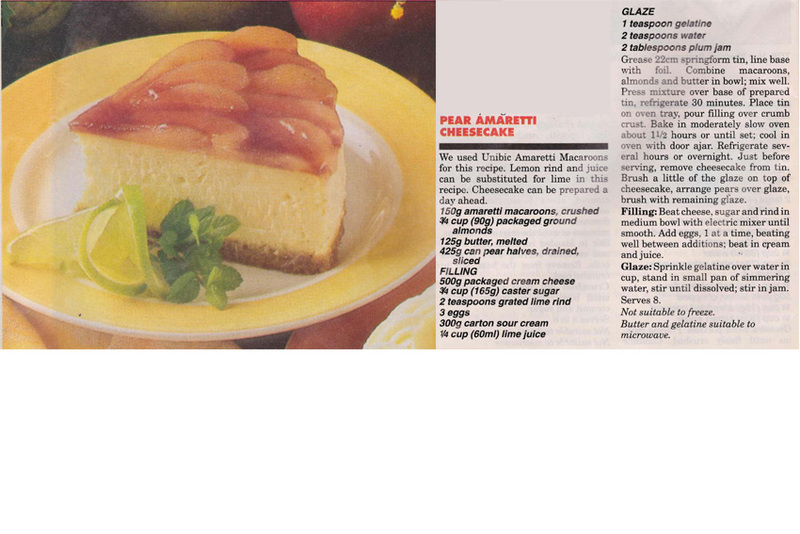 Like Mum I have a pretty large collection of cheesecake recipes, but this is the first one I’ve come across that uses Italian Macaroons as a base and pears as a topping. You could use fresh pears in place of the canned ones if you wanted to, but I think you’d need to poach them first to soften them. This entry was posted in All Recipes, Desserts and tagged 1990s, cream cheese, ground almonds, italian macaroons, lime, pear amaretti cheesecake, pears, sour cream by bebsrecipes. Bookmark the permalink.